HOLLYWOOD—Aside from her turn in the musical comedy “The Rocky Horror Picture Show,” four decades ago, Oscar-winning actress Susan Sarandon (“Dead Man Walking”) is mostly known for her dramatic performances. Sarandon is due to be a grandmother in real life, as actress daughter Eva Amurri (from her second marriage to Italian director Franco Amurri) is expecting her first child with sports broadcaster Kyle Martino in August. She’s already picked out the nickname she wants her grandchild to call her: Honey. In the meantime, the actress is cuddling another little bundle of joy, her pet Pomeranian Maltese mix, Penny, at a press conference promoting her new comedy. She explains how she was game to play McCarthy’s grandmother, Pearl, who joins her on an adventure-filled road trip from the Midwest to Niagara Falls. McCarthy’s real-life husband, comedian Ben Falcone, makes his directing debut with “Tammy,” which he co-wrote with his wife. Kathy Bates, Gary Cole, Alison Janney, Toni Collette, Sandra Oh and Dan Aykroyd also star. Sarandon: (chuckling) Actually, we didn’t even think about it for the longest time until we started doing press, and they brought a car. I said, “You know that might remind people of that other movie.” And they were like, “Oh yeah.” So I don’t know. It was so different. I don’t think it really came up until after. Q: How did Melissa approach you about playing her grandmother? And how did you come up with your alcoholic granny look? Q: The selfie you posted recently on Twitter with Geena Davis has been trending. Q: Is that a hint that you and Geena might be doing something together soon? Sarandon: That’s a great idea! I didn’t think of that, but that’s a great idea. I’d love to work with her again. They had kind of knocked around some ideas of a sequel to “Thelma & Louise,” but they were so ridiculous. I remember at one point saying, “but what would we do?” And somebody said, “You’d collect a big check is what you’d do.” I don’t know how you’d resurrect them in any way. I love Geena. It was great to see her. We had a nice stay together, but at the moment, I don’t know what that would be. It has to be sitting down because when we stand up, she’s a foot taller than I am. That’s why the car worked (in “Thelma & Louise”), because we were kind of on the same level, but actually she’s so much taller. I’m shrinking and she’s still 6’1”. But it was great to see her. I had no idea that would happen. Penny (my dog) tweeted that and it just went crazy. Q: How was it working with Gary Cole, who plays a guy you pick up at a roadside bar? Sarandon: Who else was in the running? But, thank you. Q: You’re only 13 years older than Alison Janney, who plays your daughter, and she’s only 11 years older than Melissa. How did you feel when you were cast as Melissa’s grandmother? Sarandon: I’m bad at math. I just did what they said. We didn’t add it up that way. It actually makes sense if you figure that my character was 16 when she had her daughter and Alison’s character was only 16 when she had her baby. It’s totally possible. I was just totally happy to do something like this. It’s very liberating to look that bad. We just accentuated everything that you normally would hide so it didn’t matter if I was sweaty or the lighting was bad. That was kind of cool. We’ll see if it works. But at the time, I was like, “Let’s go for it.” It wasn’t in my head, any of that stuff. I was just kind of focusing on the people in it. I’ve never been a math person so people’s ages don’t resonate with me. If you look at my life, you’ll see that I’m like a free agent. I just travel in and out all over. I’ve never done anything according to the right schedule or been with the people with the right whatever. It wasn’t actually a huge deal. It was my (prosthetic) cankles that posed a problem because we had three sets, and they had to come on and off at different times, according to where we were in the story. I was putting peppercorns in my shoes to make me limp. It was that kind of stuff I was focused on rather than if it was plausible. Really, there are other things in the movie that are equally questionable. So you either make the leap or you don’t. If the soundtrack gets you going, then that’s fabulous. Q: Did you bring something of your own grandmother to the part? Sarandon: I brought my rug. My grandma made rugs, so I brought a rug and we added that. That was a homage to my grandma. Q: At one point, you have to act with a paper bag over your head. Was that weird? 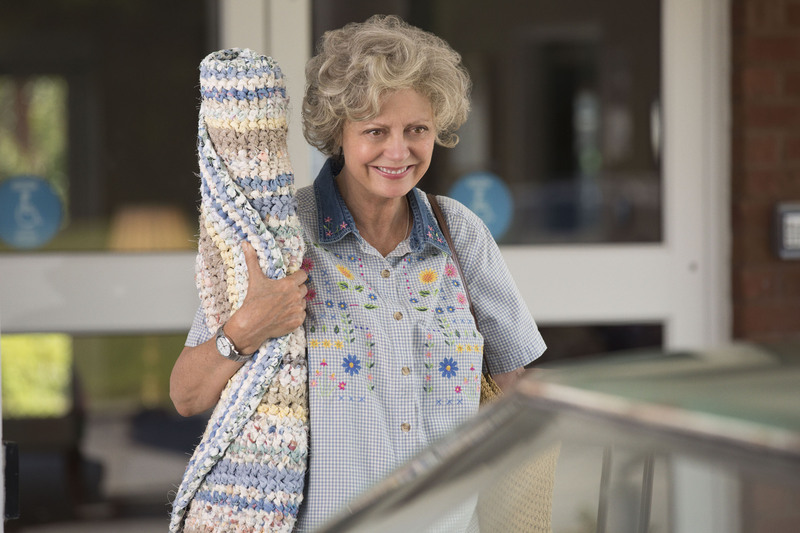 Sarandon: The brown bag was very important for finding my character. I don’t know if it’s as funny when you’re outside the brown bag but inside the bag, looking at Melissa, and putting our heads together, and whispering, “Just take the money!” or whatever I say, we couldn’t get through a take. I don’t know why that seemed so funny. I would suggest seeing the movie with a bag over your head with slits for your eyes, because there’s something about being in that bag that just broke me. It was all fun. You rarely get in a situation where there’s such depth of field in terms of all the supporting actors and everybody where you feel safe enough to do things. You want to please Ben so badly, but he never, even when it’s not working, he never makes you feel like you’ve failed. So you can make your mistakes 100 percent. That’s really really liberating and fun to be able to go with it and suggest stupid things. And one out of 10 maybe is a good idea. For me, it was really a wonderful experiment and a way of working that I hadn’t worked on films in a long time. If this movie’s not a success, I’ll never do it again. So, I’m really hoping that it’s as much fun for everyone else as it was for us doing it, and that it worked. Q: Your dog, Penny, is in the movie? Sarandon: Yes. It’s like Where’s Waldo. You have to find Penny in the movie. You have to see it a few times in order to find her. Q: You’re going to be a grandmother soon? Sarandon: Yeah, in August. This is my grandma name: Honey. Q: Have you learned anything about being a grandma from doing this movie? Sarandon: Definitely what not to do. Q: Pearl and Tammy have a good relationship, though. Sarandon: Yeah, that’s what’s unexpected is that it settles into some really emotional things that happen, which Melissa hasn’t before had an opportunity to show that she’s so much in the present. It’s special that way.